We're going to start with the basic requirements of your Saltwater Fishing Equipment. Then we'll send you to the Rod and Reel pages. Then we'll talk about the three major types: Baitcast, Spinning, and Fly Casting. 1. Cast a fair distance for long periods with minimum fatigue. 2. Cast and work effectively the types of lures you’ll be using. 3. Set the hook, fight, and land the fish you’ll be going after. 4. Hold up in the harsh saltwater environment. Most of the rods and reels made for saltwater fisherman today will last with a minimum amout of maintenance, as long as you avoid some common mistakes and have them professionally cleaned every so often. So that takes care of No. 4 above. We'll cover Nos. 1-3 in the rod and reel pages, and we'll talk about the different types below. Saltwater Fishing Rods - Learn the essential information for selecting rods, including brands, specs, advice on Baitcast, Spinning, and Fly Rods. Saltwater Fishing Reels - Learn the essential information for selecting reels, including brands, specs, advice on Baitcast, Spinning, and Fly Reels. Baitcast reels, also called level-wind, are the most popular in Texas, especially along the upper coast. One reason I believe this to be the case is that baitcast reels are the first choice of most bass fishermen in Texas. Those fishermen who transition to saltwater end up using them along the Texas coast. They're used to them and they work very well. The advantages include distance, casting accuracy, and fighting the fish. The downsides are backlashes, caused by inexperience, casting into the wind, carelessness, or catching gear on your back cast. A bad backlash looks like a rat’s nest and can be impossible to get out without cutting line. But with practice the baitcast reel, in my opinion, is the most effective saltwater fishing reel for most conditions. Spinning rods and reels, used widely by saltwater and freshwater fishermen throughout the country, are also effective. Much of the differences in preference between the two is linked to early experiences and the tendency for geographical preferences for one or the other. Spinning equipment is more versatile in the weights of lures it can cast. Backlashes are almost non-existent, and a common problem with line twist can be reduced by utilizing some simple tips. For the beginner saltwater fisherman who wants a short learning curve, a good spinning set up would be my top recommendation. This set up will be the most effective in certain situations, and a transition to using both baitcast and spinning can occur with more experience. Fly fishing gear can be very effective in certain situations along the Texas coast. It is the most difficult to learn to use effectively, but it is rewarding when done well. We are blessed in Texas to have an abundance of redfish, who present fly fishermen with some exciting encounters in shallow water. Fly fishing equipment can be used to present saltwater flies delicately to spooky fish in shallow, clear water. The flies can be picked up and moved quickly, and the fight is a lot of fun! 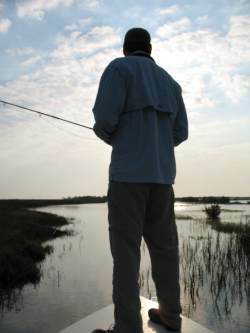 Fly fishing also presents fun opportunities to tie your own flies to imitate the forage along the Texas coast. Click here for information on Saltwater Fishing Tackle, including braid, mono, and flourocarbon line, jigheads, hooks, popping corks, swivels, and weights. Click here for more information on Saltwater Fishing Gear, including nets, clippers, clothing, boots, hats, sunglasses, tackle boxes, and pack. Return from Saltwater Fishing Equipment to the Home page.